ONGC Various Post Govt Job 2018 Syllabus Check Here. ONGC Notification is out. ONGC is recruiting for 86 Various Post Govt Job Posts. You can check ONGC - Oil and Natural Gas Corporation Limited last date, download ONGC notification, visit ONGC official website and check other ONGC Vacancy details.Complete Vacancy and recruitment Details about 86 Various Post Govt Job vacancies in ONGC are provided below by JobSarkari.Com only for you. Mode of Payment. Candidate Can Pay Fee Through E Challan At Any Branch of SBI in India in Favour of ONGC Power Jyoti A/C No. 30827318409 of SBI, Tel Bhavan Dehradun. Assistant Technician (Instrumentation) Candidate Must Have Passed 03 Years Diploma in Instrumentation Engineering. 01 02 01 00 04. Assistant Technician (Mechanical) Candidate Must Have Passed 03 Years Diploma in Mechanical Engineering. 01 01 00 00 02. Assistant Technician (Electronics) Candidate Must Have Passed 03 Years Diploma in Electronics/Telecom./ E&T Engineering or M.Sc In Physics with Electronics. 02 02 00 00 04. Assistant Technician (Civil) Candidate Must Have Passed 03 Years Diploma in Civil Engineering. 01 00 00 00 01. Assistant Grade-III (Transport) Candidate Must Have Passed 03 Years Diploma in Auto/Mechanical Engineering/Post Graduate Diploma in Business Management/Administration or Post Graduate. and Having Valid Heavy Vehicle Driving License. 01 00 00 00 01. Junior Technical Assistant (Survey) Candidate Must Have Passed 10th Class with Science and Trade Certificate in Surveying. 01 00 00 00 01. Junior Assistant Technician (Cementing) Candidate Must Have Passed 10th Class with Science and Trade certificate in Auto/ Fitting/ Diesel/ Instrumentation/ Turner/ Machining/ Tractor/ vehicle/ Welding/ Black smithy/ Boiler Attendant/ Machinist Grinder Trades. Must Have valid Heavy Vehicle Driving Licence. 01 00 01 00 02. Junior Assistant (Accounts) Candidate Must Have Passed B.Com with Proficiency in Typing 30 w.p.m and Certificate/Diploma of Minimum Duration of 06 Months in Computer Applications in the office Environment. 03 01 01 00 05. Junior Fire Supervisor Candidate Must Have Passed Class 12th with 06 Months Experience in fire Services. Valid Driving Licence for Heavy Vehicles Essential. Driving Test on Fire Tender/ Heavy Vehicle Applicable. 09 04 02 00 15. Junior Assistant (Personnel & Administration) Candidate Must Have Passed Graduate with Typing Speed 30 w.p.m. Certificate/Diploma of Minimum duration of 06 Months in Computer Applications in the Office Environment. 05 02 02 00 09. Junior Motor Vehicle Driver (Heavy Vehicle) Candidate Must Have Passed Class 10th with Valid Driving Licence for Heavy Vehicle and 03 Years Driving Experience of Heavy Vehicles. 01 01 00 00 02. Junior Motor Vehicle Driver (Winch Operations) Candidate Must Have Passed Class 10th with Valid Driving Licence for Heavy Vehicle and 03 Years Driving Experience of Heavy Vehicles. 03 02 00 00 05. Junior Assistant Technician (Fitting) Candidate Must Have Passed Class 10th with Science and Trade certificate in Fitting. 02 01 01 00 04. Junior Assistant (Materials Management) Candidate Must Have Passed B.Sc with Physics or Maths as One of the Subjects with Proficiency in Typing 30 w.p.m with Certificate/Diploma of Minimum Duration of 06 Month in Computer Applications in the Office Environment. 02 01 00 00 03. Junior Assistant Technician (Electrical) Candidate Must Have Passed 10th Class with Science and Trade Certificate in Electrical trade. Should Have Valid Certificate of Competency as Electrical Supervisor. 03 02 02 00 07. Junior Assistant Technician (Welding) Candidate Must Have Passed Class 10th with Science and Trade Certificate in Welding. 01 00 00 00 01. Junior Assistant (Official Language) Candidate Must Have Passed Graduate in Hindi with English as one of the Subjects. Typing speed 30 w.p.m in Hindi. And Certificate/Diploma of Minimum Duration of 06 Months in Computer Applications (including Hindi) in the Office Environment. 01 00 00 00 01. Junior Fireman Candidate Must Have Passed Class 10th with Fireman’s Training of 03 Months Duration. Valid Driving Licence for Heavy Vehicles Essential. Driving Test on Fire Tender/ Heavy Vehicle Applicable. 10 05 04 00 19. Total No. of Vacancy 48. 24. 14. 00. 86. Height. 168 Cms. 163 Cms. 163 Cms. 160 Cms. 152 cms. 147 cms. Weight N/A N/A N/A N/A Candidate Must be Proportional to Height But Not Less Than 46 Kg. Candidate Must be Proportional to Height But Not Less Than 46 Kg. Candidate Need to Run 800 Mtrs. in 4 Mins And Candidate Have to Lifting And Carrying a Person of Approximately His Own Weight by the Fireman Lift Method Without Any Break to a Distance of 100 Mtrs And Candidate Need to Climb a Fire Service Extension Ladder of 34 Feet in 2 Mins. Candidate Need to Run 800 Mtrs. in 6 Mins And Candidate Have to Lifting And Carrying a Person of Approximately His Own Weight by the Fireman Lift Method Without Any Break to a Distance of 75 Mtrs And Candidate Need to Climb a Fire Service Extension Ladder of 27 Feet in 2 Mins. A1 And A2 Min 18 And Max 27 Years. Min 18 And Max 33 Years. Min 18 And Max 35 Years. W1 Min 18 And Max 27 Years. Min 18 And Max 27 Years. Min 18 And Max 32 Years. 2. Physical Standard Test (PST)/ Physical Efficiency Test (PET). 3. Typing Test/ Skill Test. 2. Candidate Can Register Before Applying for the Post. 4. Login With ID and Password to Complete the Application Process. 5. Upload the Scanned Copy of Required Documents in the Prescribed Size and Format. 6. Candidate Can Apply Online On or Before 20th February 2019. Q. What is the Last Date For ONGC Various Post Govt Job Vacancy ? A. 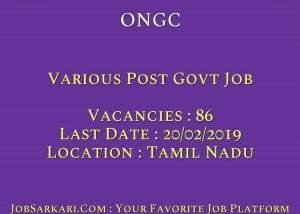 Last Date for ONGC Various Post Govt Job Posts is 20/02/2019. Q. What is the Form Type of ONGC Various Post Govt Job Recruitment ? A. The Form Type for ONGC Various Post Govt Job Posts is Online. Q. 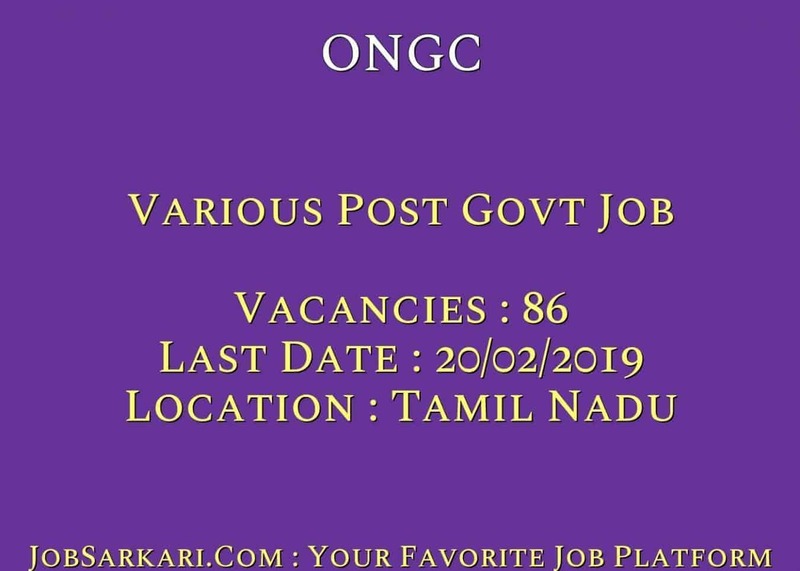 How many vacancies are available in Oil and Natural Gas Corporation Limited Various Post Govt Job Posts ? A. There are about 86 Vacancies in Oil and Natural Gas Corporation Limited Various Post Govt Job Posts. Q. What is the Full Form of ONGC ? A. Full Form of ONGC is Oil and Natural Gas Corporation Limited .